What if you could get the inside scoop on running a freelance business, even before you started? Freelancer, Jennifer Lancaster, shows you the ropes in this colour edition of How to Start a Freelance Business. Save yourself the headaches other freelancers suffer due to lack of planning, lack of direction, and lack of marketing know-how. 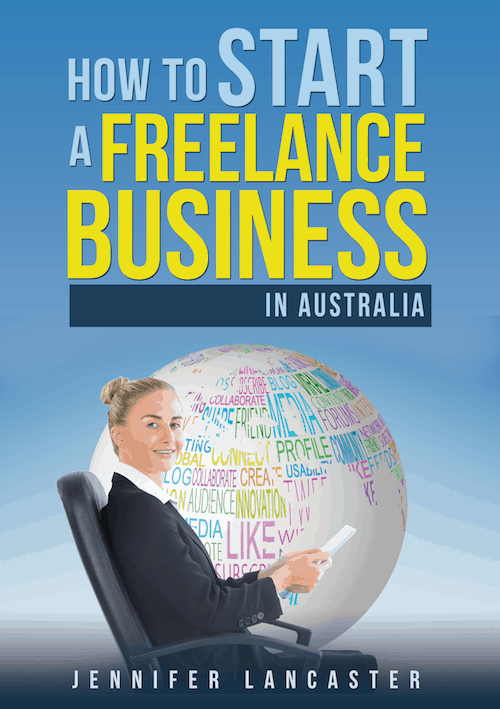 How to Start a Freelance Business (in Australia) is a book that delves into your motives for freelancing, how to divine your talents, and how to set appropriate goals. In the business planning section, we focus on structure, costs, budgeting, and competitor research… not forgetting the all-important issue of getting clients. The fun section — money — includes cash flow, paying taxes, keeping records… and the importance of working out your billable rates properly. You'll get some ideas for offsetting your freelance business income as well. Get busy on projects quickly, with social media, blogging, and other affordable marketing methods. Format: Paperback is 97 pages, with coloured headings. Includes glossary, resources, and social media types table. The security you perceive in a job is not really there. Needing security, those made redundant dismiss any ideas they had of starting their own service business. They think “I’ll just do this menial job for a while to get by”. Unfortunately, these days there is no such thing as a secure job, so you might as well be doing something you love. I need income right now. Studies show the average unemployed worker will be waiting six months in this stagnating economic climate for a full-time job. Instead of being downbeat, you can create some income within two to four weeks. Outsourcers don’t have to be young. Some employers are ‘ageist’ and if you are in the 40-70 range, you might really come up against it. But harried small business owners or marketing managers are not that interested in your age, gender, or whether you’re a mother with an upside-down schedule… but they do want their problems solved, and are open to outsourcing different aspects of business that are too hard and too time-consuming for their staff to do. You will have a better quality of life by freelancing. There is flexibility in that you can choose to work fewer hours than normal, at the times you need. You can run a service business only working 12 hours per week and some nights, if you really wish to. Or you can work (with meetings as well) 40 hours per week and earn a really good income, depending on your level of skill. Service businesses do not need high overheads or capital. Unlike a regular bricks & mortar business, you will operate out of home and your main costs include telephone, internet, business cards, association membership, the odd development course, and networking functions. And a few dollars for petrol. No boss to answer to. Your clients will be the ones you have to please, but they come and go. You can take a week off if you want to. No wasted time commuting. Also save time on office gossip, longwinded meetings, and incidental emails. All going to plan, you can be a lot more productive. ‘Spare time’ can be spent in the betterment of your skills. Be there for your family. For many parents, this is the most important factor. If your little one is sick you won’t feel guilty for staying home, and at school holidays you can slacken off the work a bit to spend time with the kids. (Perhaps working at night to maintain your clients). You can finally pursue the dream career you have been putting off. If your spouse is working or you have gotten a large payout, you have some breathing space to learn and grow in a new line of work. Available direct (Australia Post: in 5-10 days) or from online retailers Fishpond or Amazon (17-20 days). PAYPAL is the best option for speed.